Casey Weathers c/o Phoenix Desert Dogs [Arizona Fall League] - the No. 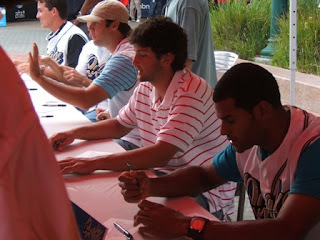 8 overall pick in the 2007 Amateur Draft personalized and signed one card in blue Sharpie. I was glad to get this back - since I'd read [on the Freedom Cardboard message boards]someone had received a recent success from him. I thought it was ironic a few days after I mail my request on 10/10/08 - he gets injured and eventually needs Tommy John Surgery. Received 4/28/09 postmarked from Sacramento - I think a postmark on a self addressed stamped envelope [SASE] tells a lot of things i.e. where the mail was sent. Often times you get postmarks from the players hometown [or close to it], from the cities they've travelled to as players, et al. I was in Las Vegas on a three-day vacation and not necessarilly being a 'Sin City' type - what interested me was going to at least a couple of Las Vegas 51s baseball games. 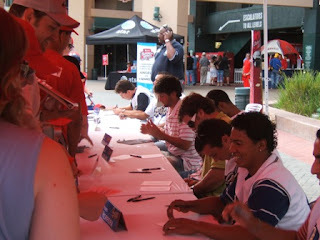 I was interested in getting some in-person autographs from the Toronto Blue Jays' Triple-A affiliate. From the looks of it, the team store offered a quaint selection of baseball cards. A 'two-pack' of Tristar blasters [2008 Projections High/2008 Prospects Plus] were being sold for around $42 - there were about five packs in each blaster [with a guaranteed autograph]. There was old junk wax on top of one of the showcases - packs of what looked like 1991 O-Pee-Chee Premier were $1 each. There were also official MLB baseballs [individually wrapped in tissue, but in ball cubes or boxes] - $15 each. There were old team sets - most were from the 'junk wax' years, but the 1985 Fleer Angels was interesting [$4]. Some guy bought three of the team sets for whatever reason [I don't think the cards he bought contained anyone playing down on the field] and was guiding the lady working there what to reach for. There were some various singles in one showcase - maybe selling for $2-$5 each, though none might be worth more than $0.50. I saw there were plastic boxes with had 90 different cards for $5 -with the cards I have in my A-Z boxes, I could probably come up with a 100 sets of 90'repack' cards. The next night I ended up purchasing an official Major League Baseball and one plastic box of those 90 assorted cards - I think I'm always will to look at another man's junk [trading cards] even if I know there isn't remotely valuable in a repack. However, how do I use the cards [if I know it won't be cards from the last five years] - making a blanket statement like, 'I'll use these for through the mail' requests never work out because it is an excuse to pick up more crap. I broke down because I saw a 1988 Fleer Tim Flannery card on top of one - the card isn't special by any means. I didn't grow up with it or anything. It is just a card with a posed shot of a player and his surfboard. The particular card ended up being damaged of course - never fall for the 'showcase' card in any repack, because it is the one that ends up being off-conditioned thanks to the Hefty Hinge Sports Cube. The damage was an indentation left by the piece of plastic molded inside the box to help snap the lid shut - a design fail for trading card storage if there was one. For storage items such as plastic boxes, the piece of plastic [that gives the ability for the collector to snap the lid shut] should be on the outside, not where it can damage the top card. I don't really want to have to worry about cards being damaged by a plastic box - but maybe I shouldn't fill the card plastic box up to 'capacity' and always use some kind of filler card [the thicker, the better] to protect the top cards. The rest of the cards were 80s-90s filler - it is kind of fun looking through the cards, especially some of the cards using a less than flattering image of a particular baseball player. The box wasn't completely devoid of stars, though I think no cards were worth more than a nickel each. The lone card from the last 10 years was a 2005 Leaf Certified Material Miguel Cabrera. My father roused me out of my dreamy sleep to say a young pitcher for the Angels was killed -the guy who pitched last night [Wednesday]. Last night I was watching the game and thought with the number of flameouts and never has beens - Nick Adenhart may have been the best pitcher from the 2004 draft. Here he is pitching at 22 on opening week for the Angels - throwing six shutout innings. Watching him leave game, I said there he goes into the clubhouse [the young kid did his job]. I kind of went back to a half-sleep - I kept thinking it was a mistake and if someone was killed, maybe it was someone else. It wasn't Adenhart, right? He was the great hope for the Angels on the mound for the last several years and considering where he was, things kind of worked out for him Wednesday night. Fans who follow the Angels' system knows the story about Adenhart being a 'highly regarded' 14th round choice - whose stock plummeted because he had to go get Tommy John surgery in high school. All I knew now was an Angels pitcher was killed - it wasn't a dream and as Adenhart realized his dream for one night, it was all taken away hours later. I didn't want to see it, didn't want the news confirmed, but I turned on the TV and it was on SportsCenter - anchor Chris McKendry [and Buck Showalter] was talking about Adenhart getting into a fatal hit-and-run accident [along with two others who perished with him, Courtney Stewart and Henry Pearson and a former Cal State Fullerton baseball player Jon Wilhite who was in critical condition]. There was a statement from Torii Hunter read over the air - I go to MLB Network and Hunter was basically saying what was on the statement. You take it for granted, but never know when its your time to go. Lots of things going through my mind and it seemed almost canned and petty - would I post a pic on the blog? What will the Angels do with a depleted starting rotation? The Angels were to induct Brian Downing and Chuck Finley to their Hall of Fame Thursday night, but the game vs. the Oakland Athletics was postponed and what may have been a celebration of two franchise stars turned into a mourning party. 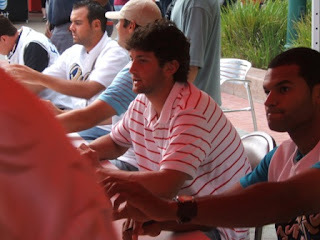 Random memories as a fan - passed over an Adenhart 2004 Donruss EEE certified autograph rookie card and got a Phil Hughes instead [both were $5 each] at the 2006 Seattle Mariners/San Diego Padres Fan Fest card show in Peoria. 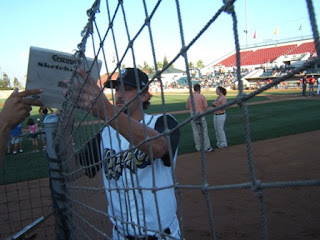 Saw him signing autographs at Rancho Cucamonga [Los Angeles Angels high-A affiliate] in 2006 after he was called up from low-A, saw him at Meet the Quakes day and got a mini-bat signed the same year - saw him a couple of spring trainings in 2007 and in 2009. The Angels have had bad luck this week with Adenhart's death and an Angels' fan [Brian Powers] - getting into a fatal fight after an Angels' game opening night. You really can't say you hope things 'bounce back' into place, the way it was before like if this was a game played. I think you just let things sink in and let things be. When reality hits - it leaves you cold and befuddled.